The DR PRO XL-30 16.5 HP field and brush mower provides a 30" (76cm) cutting width and will power through saplings of up to 2.5" with ease. 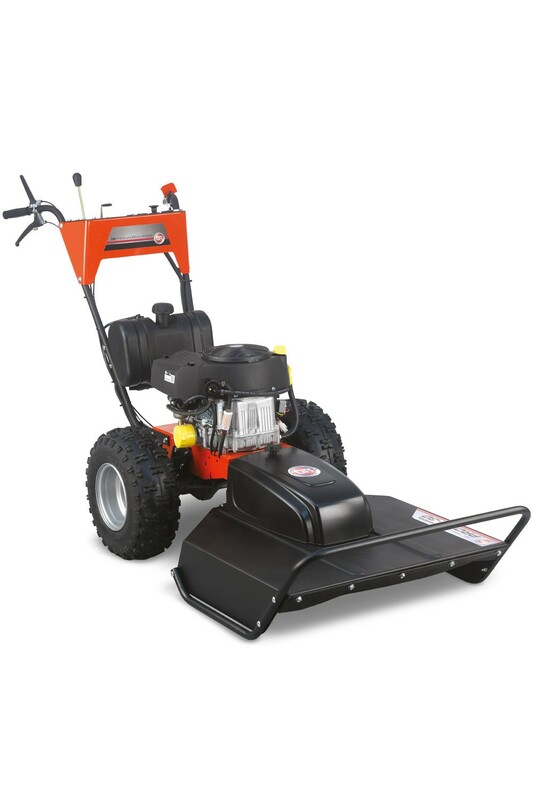 Powered by an electric starting Briggs & Stratton Professional series engine, this powerful field and brush mower has the new power steering function which makes it easier to navigate the field and brush mower around trees and obstacles or to make a 180 degree turn at the end of the row. The 30" wide cutting deck ensures progress is swift when cutting through weeds, brush, grass or even 2.5" thick saplings but moving the machine around is still achievable. 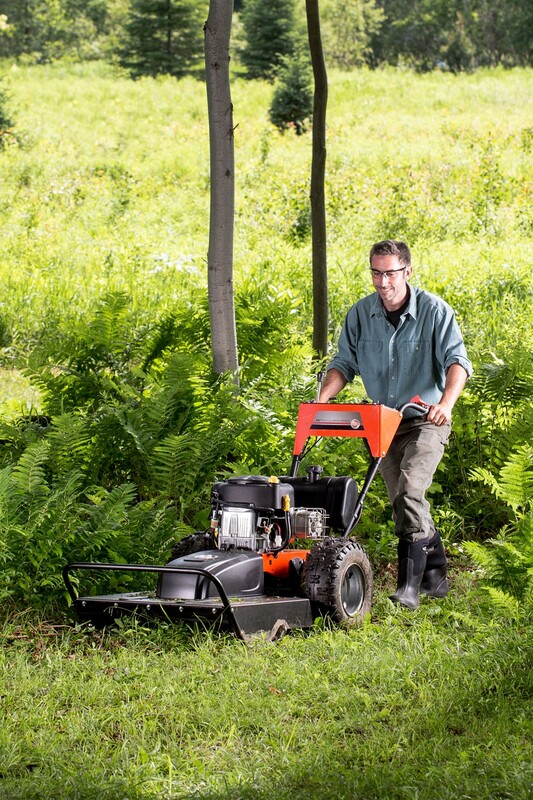 The 30" wide deck on the PRO-30 is wide enough to mow paddocks and large areas quickly, but is still extremely agile. Unlike the rigid, fixed decks found on some brush mowers, the DR deck pivots from side to side, enabling it to follow the contours of rough ground. This feature minimizes scalping and improves traction. 18" X 6.5" X 8"
What happens if I accidently hit a rock or tree stump with my Field & Brush Mower blade? If you hit a rock or immovable object, the belt drive system allows the belt to slip reducing the possibility of causing damage to the spindle and protecting the engine. If you wish to operate your DR Field & Brush Mower in an area where there are hidden rocks or tree stumps, rather than using the metal brush blade the optional bladeless mowing attachment which uses heavy duty nylon cord can be used for mowing grass and weeds. 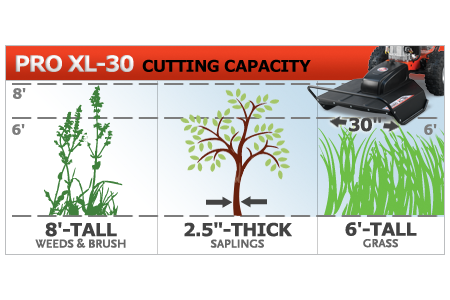 Which attachments are available to fit on the PRO XL-30 Field & Brush Mower? There are two attachments available for the DR PRO XL-30. These are the 42" wide lawn mower deck and the 42" grader / snow blade. There are also snow chains available to increase traction if the machine is to be used in snow or ice. Currently these are the only attachments available in the UK. Is the cutting height adjustable? DR Field and Brush mowers have a fixed cutting height of 3.5”. How will my DR Field & Brush Mower be delivered? Your DR Field & Brush Mower will be delivered to an approved DR dealer in your area usually within 2 working days, where a skilled DR service engineer will fully assemble the machine and make sure everything is operating at optimum performance. If you select the Premium Delivery option in the checkout, your local DR dealer will contact you to arrange a convenient time for them to deliver the machine to your property. You are also able to collect your order from your local DR dealer if this is your preferred option. Will I have to collect the cut material when I have finished mowing? No, the mulching decks fitted to the DR Field & Brush mowers are designed to cut and then recut the material into small pieces before being dropped on to the ground. Does the PRO-XL 30 Field and Brush mower have the Power Steering feature? Yes, each wheel is fitted with a hand operated disc break. Simply squeeze a brake on one side and the machine will pivot effortlessley around that wheel. 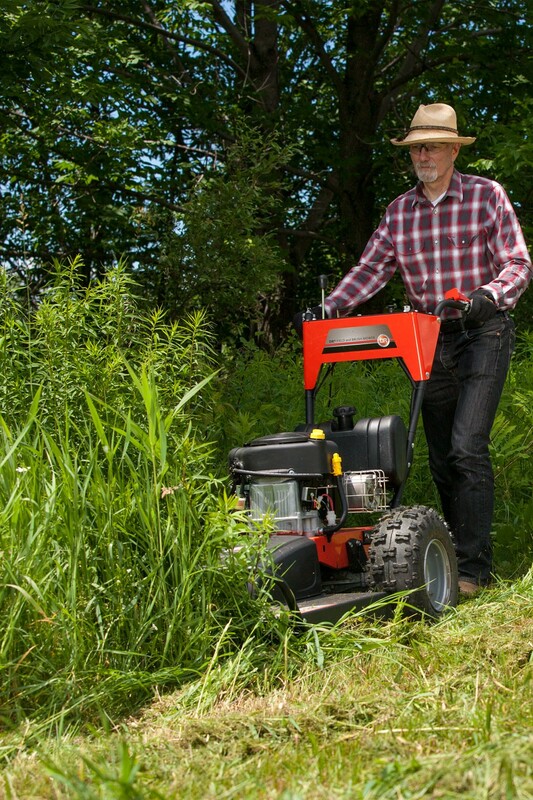 Do I need to use a fuel stabiliser in my DR Field & Brush Mower? We highly recommend using B3C Ethanol Shield which prevents damage to the engine caused by bad fuel. You can learn about the benefits of using B3C Ethanol Shield here. Is the battery for the electric starting charged whilst the engine is in operation? 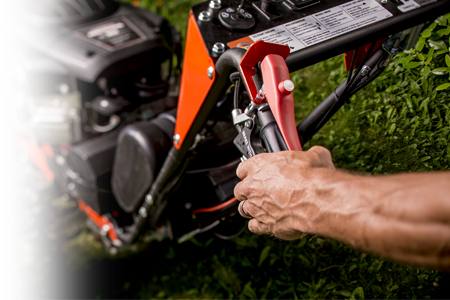 The battery will charge whilst the Field & Brush Mower is in use, it will take at least 45 minutes of continuous use to ensure the battery is properly charged. If the battery loses its charge you will need a charger to recharge it. These are available here. Where can I get spare parts for my DR Field & Brush Mower? Your local DR dealer will be able to supply you with any spare part for your DR Power machine. You can find your closest DR Power stockist by simply entering your postcode here.